George Gershwin (1898-1937) was an American composer and pianist who composed music for 18 stage and screen Musicals with his lyricist brother Ira Gershwin (1896-1983). Born Jacob and Israel Gershowitz in Brooklyn, New York, George and Ira (as they were called from a young age) changed their last name to Gershwin early on. They collaborated from 1921 until George’s premature death in 1937 and were responsible for the award winning musicals Porgy and Bess, Of Thee I Sing, and Girl Crazy among others. To honor the Gershwin brothers' contributions to musical theater, the Gershwin Theater opened on Broadway in 1972 and is devoted to showing the top musicals of the day. 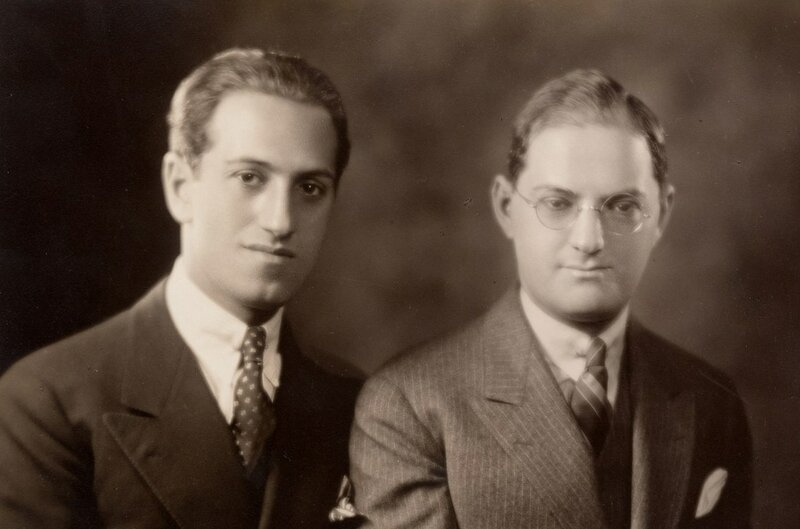 In 1985 George and Ira Gershwin joined a select group of only three other songwriters to be awarded the Congressional Gold Medal. In 2007, the Library of Congress created The Gershwin Prize, named after George and Ira, to recognize the profound and positive effect of popular music on culture. George Gershwin started playing piano secretly at a friend's house at an early age. His parents bought his brother Ira a piano for his 12th birthday, but it was George who played it. His musical skills being noticed, George studied under Charles Hambitzer, the classical composer Rubin Goldmark, and avant-garde composer-theorist Henry Cowell and would practice piano many hours a day while learning advanced music scoring and theory. Later on, the great stride pianist Eubie Blake once said of George's piano playing, “George Gershwin was good enough to learn some of those terribly difficult tricks that only a few of us could master.” After leaving school in his mid-teens, for the next ten years George worked as a staff pianist and song plugger for Jerome H. Remick, was a rehearsal pianist for Dillingham-Ziegfeld, played concerts at Aeolian Hall producing around 130 piano rolls, published his first national hit “Swanee” with the lyricist Irving Caesar, wrote songs yearly for the George White Scandals, went under contract with Max Dreyfus producers, produced his first Broadway songs with William Daly and Buddy DeSylva, and wrote the famous jazz symphony "Rhapsody In Blue", all before becoming involved full time with his brother Ira. Ira Gershwin played a prominent part in several school newspapers and magazines throughout his school years. During high school he became close friends with the famous lyricist Edgar Yip Harburg who influenced him both in his writing and in his love of musical theater. In 1921 Ira (using the pseudonym Arthur Francis, his two other siblings' names) became involved in the music business writing lyrics for the musical Two Little Girls in Blue and starting a small collaboration with his brother George on the score for A Dangerous Maid. However, it wasn't until 1924 that Ira became involved with George full time under his own name. During his long lyricist career, Ira became quite adept at implementing new lyrical styles, playing with timing and unusual word combinations which contributed to the brothers' innovative new style and song-lyric combinations. From 1924-1933, George and Ira wrote 13 Broadway musicals together producing numerous song standards which brought them to the forefront as popular songwriters. These standards included "The Man I Love", "Someone To Watch Over Me", "'S Wonderful", "I've Got A Crush On You", and the four 1930 Girl Crazy song standards "Bidin' My Time", "But Not For Me", "Embraceable You", and "I Got Rhythm". The book and lyrics writers of the 1931 musical Of Thee I Sing: George S. Kaufman, Morrie Ryskind, and Ira Gershwin all received a Pulitzer Prize (a special Pulitzer Prize was posthumously awarded to George Gershwin in 1998). It is astonishing that during this full-time collaboration with Ira, George Gershwin found time to compose his six complex classical works "Rhapsody In Blue” 1924, "Concerto In F" 1925, “Three Preludes For Piano" 1926, “An American In Paris” 1928, “Second Rhapsody” 1931, and “Cuban Overture” 1932. In 1935, George and Ira, along with the author Dubose Heyward, wrote the folk/jazz opera Porgy and Bess which is considered a classic, and which helped unveil the harsh realities of segregation. After this the Gershwin brothers moved to Hollywood to compose for films, and in 1937 the Shall We Dance song "They Can't Take That Away from Me” received an Academy Award nomination for Best Original Song. In 1937 while writing music for their third film, The Goldwyn Follies, George was stricken with a brain tumor and died quite unexpectedly shortly after surgery at the tender age of 38. Published posthumously, the two major song standards from this last musical were "Love Walked In" and "Love Is Here To Stay". After George Gershwin’s untimely death, Ira continued to work with collaborators ranging from Kurt Weill and Jerome Kern to Harold Arlen and Arthur Schwartz until 1946 in theater, and until 1954 in film. He spent the rest of his life working on the Gershwin family archives, the later years with the help of singer and pianist Michael Feinstein. In 1945 the Hollywood film Rhapsody In Blue about George Gershwin’s life starred Robert Alda as George Gershwin and Herbert Rudley as Ira. In 1951 many of George and Ira's songs as well as George's classical symphonies were featured in the Hollywood film An American In Paris which won six Academy Awards including Best Picture and Best Musical Score. In 1959 Ira Gershwin published his book Lyrics on Several Occasions which contains many anecdotes about the Gershwin brothers' collaboration. In 2012 Michael Feinstein published the book The Gershwins and Me about his collaboration with Ira. In 2015 the film An American In Paris was made into a Broadway Musical and received 12 Tony Award nominations including Best Musical. The American song standards composed by the Gershwin brothers continue to be performed today and will undoubtably continue to be performed well into the future.